We (Cheryl of Well Scents Aromatherapy and I, Adrienne of A. Herman Dog Therapist) wish to share Tamu’s success in the ring with you. Tamu is (as you can see here) a beautiful young male Ridgeback who was entered into an Open Dog trial at the Del Monte Kennel Club (DMKC) dog show this last weekend. Tamu is just learning. 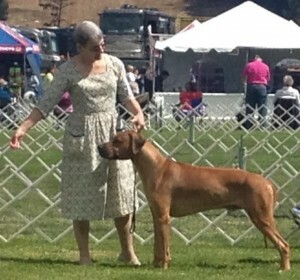 He and his wonderful owner/handler, Deborah, decided to visit our booth at the show prior to his ring experience. We decided on just the right aromatherapy blend for Tamu and he came in FOURTH PLACE…a ribbon winner!!! Everyone was thrilled for him! We love this boy and know that he is just going to get better and better as his confidence increases and he becomes more and more focused! Way to go, Tamu and Deborah!! !